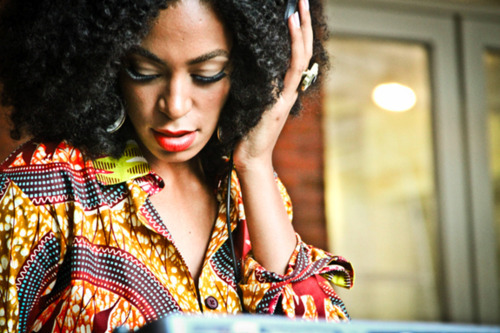 I have been following the down to earth style evolution of solange knowles for a while now and I can tell you that I am not the only one who is officially in love with her style and her hair . As a natural girl its amazing to see another natural hair celeb in Hollywood doing her thing.I love that despite the fact that her sister Beyonce is one of the biggest stars of our generation she was able to come out of her shadows and created a name and style on her own. 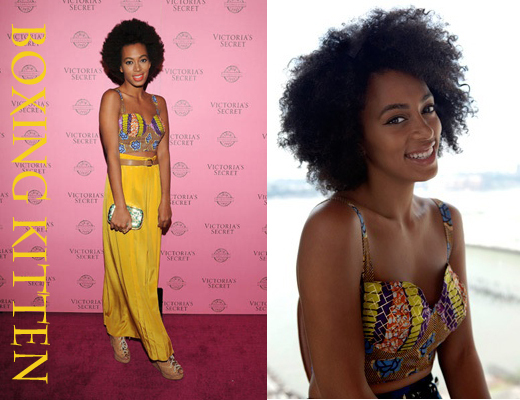 Its no secret that solange loves boxing kitten and we seen her rocking their designs over and over again. I wanted to tweet her For the rest of the month of November I ask her to please please please!!!! try one of our African designers. However after careful thinking I thought that it wil be best if the tweet came from the designers themselves. After all that's why they pay their PR people to do. In this day and age its so easy for designers to contact celebrities. I am sure they might not respond but I am sure if you persist a little bit they might respond. When Elle Varner wore this dress a few weeks ago when I tweeted her she responded back to me . So you never know. What do I like about Solange Knowles ? So solange I still love you and if you if you ever happen to read this ( 99.98% you won't) I want you to know that you are voice of so many fashionistas right now. If you wear an outfit from an African designer you will be sending a message to everyone out there that its ok to try new things and give a chance to the talented designers from other countries. What do you guys think? Do you think I am crazy ? or do you think I should have continued with my plan. I've been a fan of her style, day by day and admire her bold choices. She is one beautiful lady. Yes yes. Keep tweeting her. I love that she has her own identity when she could be living in her sisters shadow. I loved reDING THIS ARTICLE, so funny. Solange why didnt u answer ?? hahahhaa.. We love ur style ! Keep on tweeting her. Go girl!! !